Jack Straw Filaments, an Urban Visions' tenant at The Colonial Grand Pacific Building, is a high-end men's clothing store located on First Avenue between Spring and Seneca Street. Since its opening in September of last year, owners John Richards and Paola Medina have effectively distinguished Jack Straw Filaments as one of Seattle’s most innovative and exciting men’s clothing stores. Featuring designers such as Issey Miyake, Gilded Age, and Comme de Garcon, the boutique appeals to Seattle’s more fashion-conscious men who appreciate classic, well-made clothing. The store will begin to feature women's wear in 2010. The store itself is immaculately decorated and is often described as a sort of sanctuary for shoppers. With imaginative window displays, inviting leather chairs and rustic brick walls, Jack Straw is a refreshing anomaly amongst today’s more pervasive and impersonal department stores. Go experience the world of Jack Straw for yourself! 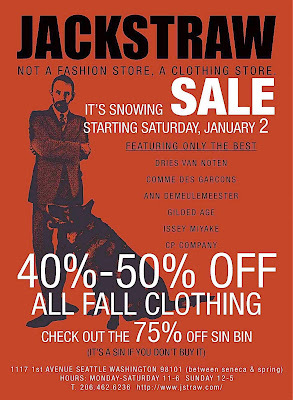 Beginning January 2nd, the boutique’s “It’s Snowing Sale” will be featuring 40-50% off all Fall Clothing, and 75% off selected items! Jack Straw Filaments is open Monday-Saturday 11-6, and Sunday 12-5.